I am very excited about the next two months. Not only will we have a new addition to the family but are going to be traveling to Durham and Columbus in December. I was talking to Lillian today about the trip and all the different family we will see. (We were having a nice snuggle time today after a morning bath.) Her new favorite phrases are "I'm so excited" and "I'm so proud" though usually this second one doesn't come across with accurate meaning. Anyway, I asked her what she was most excited about after just describing this grand trip. She replied "Play with Gideon!" I was really happy to hear her say this since we've only managed to see Gideon around once a year - not enough for same age cousins. So I couldn't NOT share this with all of you. We've been enjoying some really good Chocolate Chip Pumpkin Bread lately. Here's the RECIPE(thanks to Jenny) I had to make four loaves instead of just one because I knew it would be that good. Also, thanks to Mandy for letting me use her kitchen aid and oven since my oven likes to bake everything in half the time and at it's own temperature. I wasn't really to risk it. Also, if you are in the pumpkin mood, try her Pumpkin Crisp too - it's easy and super good. Well, it seems Lillian is growing up. Here are a few of her antics from the last few days. We were at some friends house last week. All the adults were inside, so I (kyle) was outside monitoring the kids. When I got too close Lillian said: "Daddy, go inside now. I'm talking to the girls." I knew this would come, but I was thinking it would be during junior high. A similar story: We were sitting on the couch together, and I had just turned on some of her PBS programming. Sensing that I might be staying for the show, she said: "Daddy is working now. Time to work." I got the hint and went to my study. I just had to tell someone how excited I am about the weather today. Two days ago I had to turn on the a/c again due to the ridiculous humidity. I've been sweating too much and not enjoying it as a fully pregnant woman (minus 6 weeks). So...I'm on my way to a nap under the down comforter with the windows open and wind blowing at 63 degrees! It's beautiful. The downside to the cooler weather is that I only have one or two pairs of maternity pants and Lillian also is still squeezing into last years winter clothes. It's a nice problem to have though. Here's Lillian last Christmas in Durham. Sunday was church of course, though a little different than usual due to an outdoor service of The Blessing of the Animals. Lillian stayed with us during the service, she usually is in nursery. There were cats, dogs, guinea pigs, a snake and a baby alligator. The service was much as usual, just a few extra voices during the hymns. Here's Lillian after church dancing around. Sunday afternoon friends threw me a baby party with lots of good food, advice and prayers. 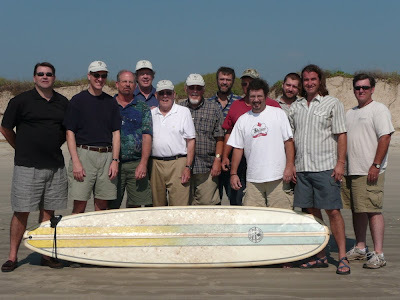 Kyle spent last weekend with a group of guys from church on Mustang Island. It's a little more than 5 hours away but a beautiful spot. Although not directly affected by Hurricane Ike, it did lose quite a bit of beach - though no buildings or houses were destroyed. Here's a shot of the group. I don't think anybody went surfing but a couple did get in the water. Kyle said they spent a lot of time on the beach playing petanque. 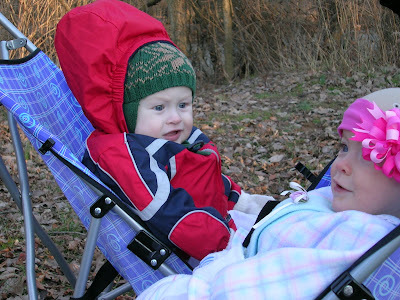 Kyle also went last year and is still hoping we will be able to get down for a visit as a family soon. I'm not sure when we are going to work this in, but it's a nice idea.